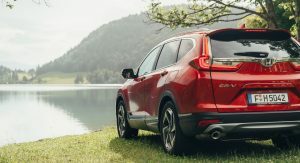 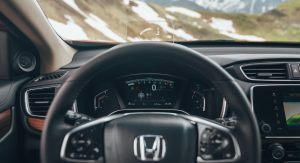 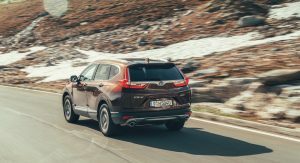 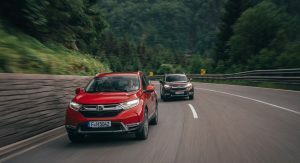 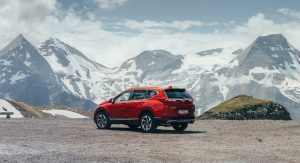 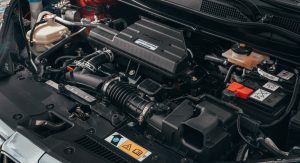 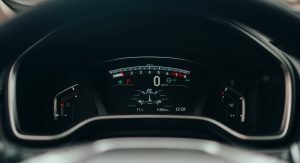 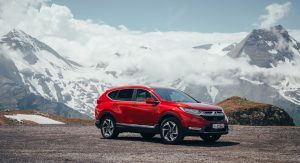 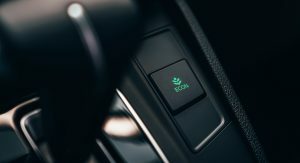 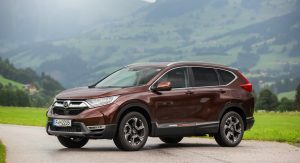 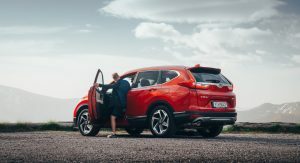 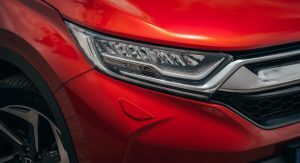 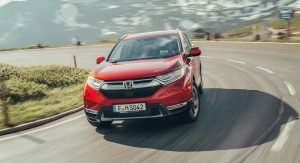 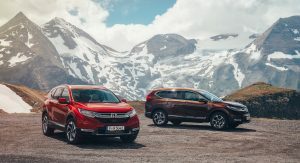 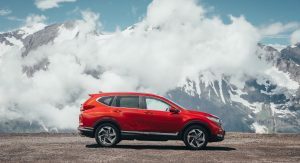 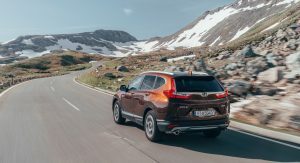 Honda is currently launching the Euro-spec CR-V in Europe, which will be available with a single engine option, the 1.5-liter VTEC Turbo petrol unit known from the Civic and of course the US-spec CR-V.
Customers in Europe will be offered the choice of either a manual front- or all-wheel drive version, as well as a CVT automatic that’s only available with the latter. 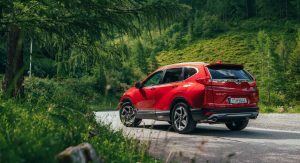 When fitted with the six-speed manual, the 2018 Honda CR-V offers 170hp (173PS) and 162lb-ft (220Nm) of torque. 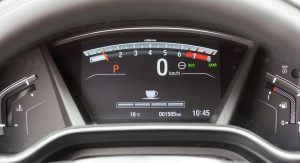 Go for the CVT and the figures go up by a little, at 190hp (193PS) and 179lb-ft (243Nm). 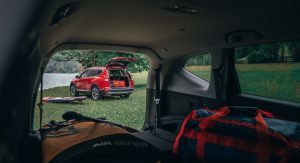 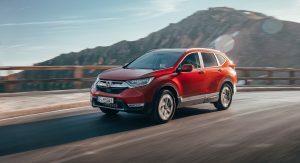 Despite the increased horsepower, it’s the manual Honda CR-V that offers the better acceleration; Honda claims a 0-62mph (100km/h) in 9.2 seconds and a top speed of 130mph (210km/h) for the FWD model, with the automatic CR-V AWD offering 10 seconds and 124mph (200km/h) respectively. 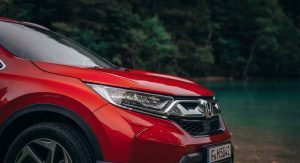 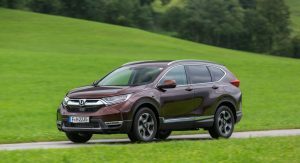 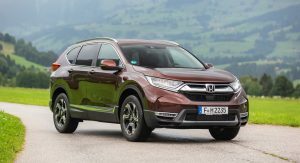 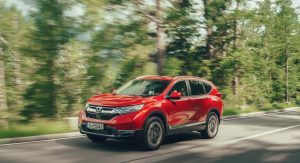 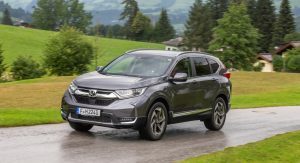 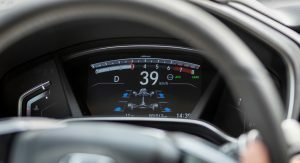 Fuel economy goes as low as 44.8mpg UK (6.3lt/100km) combined, while CO2 emissions are rated at 143g/km for the manual front-drive CR-V.
Honda has already confirmed that they won’t offer a diesel derivative of the CR-V in the region. 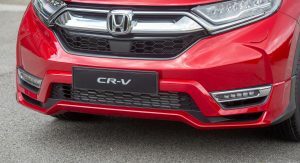 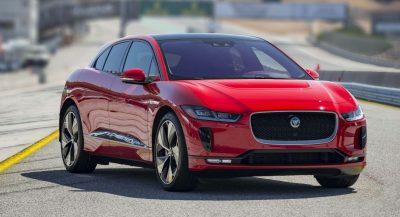 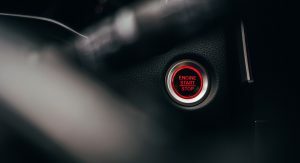 Instead, they plan to launch a new hybrid version early next year, featuring a 2.0-liter i-VTEC paired to an electric motor and a separate electric generator motor. 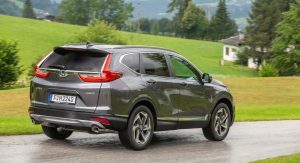 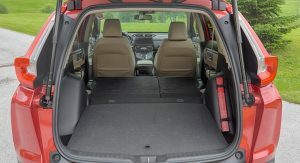 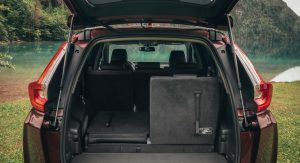 The fourth-generation Honda CR-V is the first one to be offered with seven seats as an option. 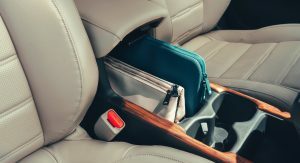 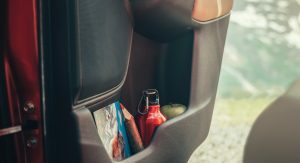 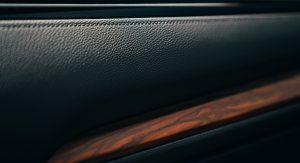 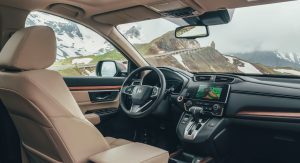 Honda claims that the new CR-V also offers class-leading interior space thanks to its longer wheelbase. 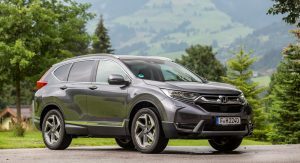 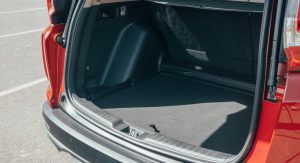 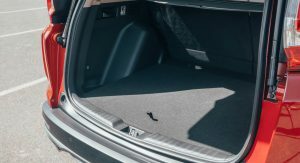 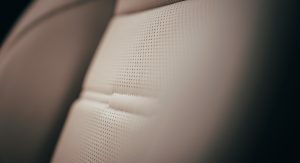 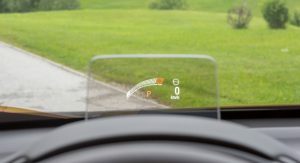 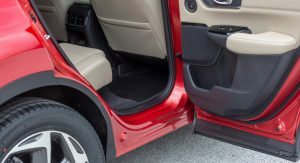 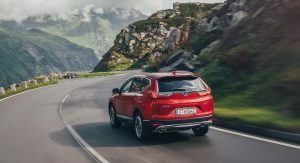 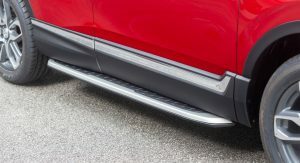 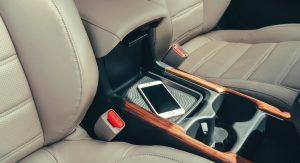 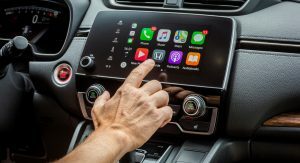 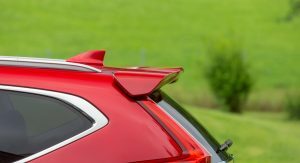 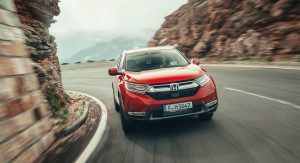 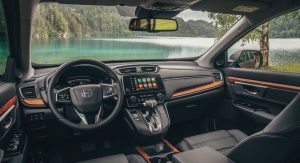 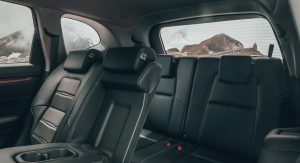 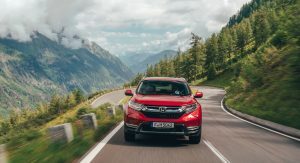 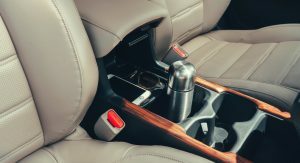 In addition, the Japanese company says that the body of their new SUV offers the best rigidity and stiffness in the segment while the Honda Sensing suite of active safety technologies is fitted as standard. 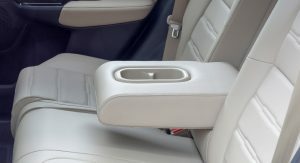 This apparently results into a solid five-star rating at the Euro NCAP safety assessment. 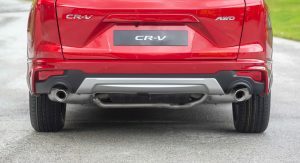 Ground clearance has been increased by 35mm over its predecessor, with 191mm for the front-drive models and 201mm for all-wheel drive models. 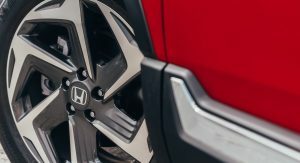 The AWD system can send up to 60percent of the torque to the rear wheels if required. 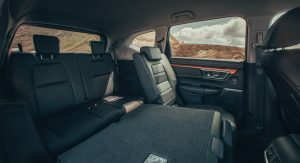 The all-new chassis features a MacPherson strut suspension at the front and a multi-link setup at the rear, with both axles getting hydraulic suspension bushings for greater ride isolation as standard across the range. 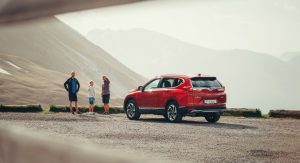 I definately prefer the new Rav4 to this. 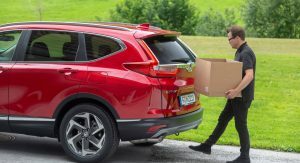 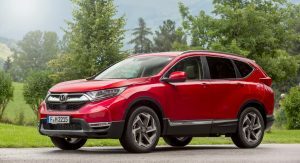 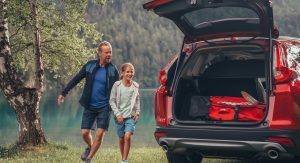 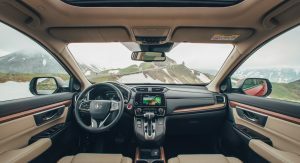 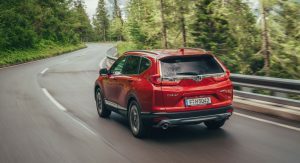 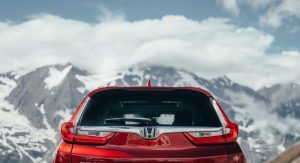 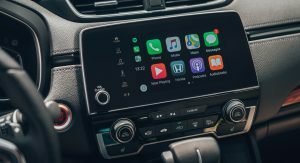 “Honda Launches 2018 CR-V In Europe”…. 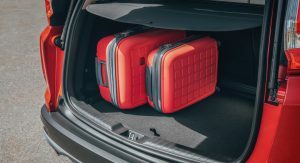 and still with killerbags? 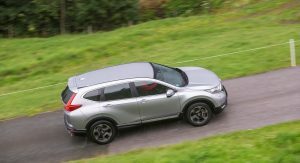 Odd that the North American CR-V with the same engine can hit 60/62 in about 7.5 seconds. 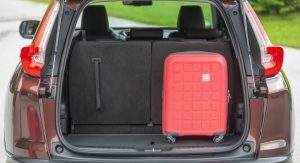 Maybe there’s added safety equipment in Europe? 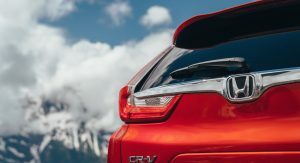 It now or never for a performance oriented CR-V Compact Crossover! 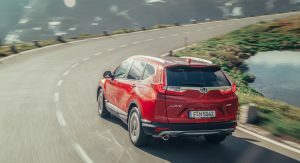 I do not think the new RDX is selling that well, so Honda probably has the permission to add in the Accord’s 2.0T into the CR-V! 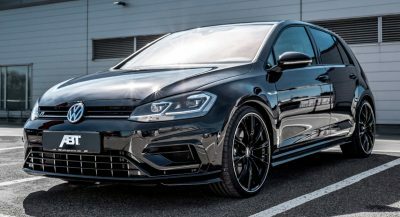 true, not selling that well because its over priced, not by much mind you, but just enough to shy potential buyers over to other brands. 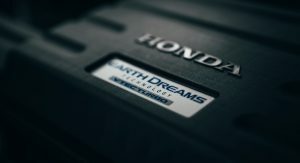 It was launched a few weeks ago. 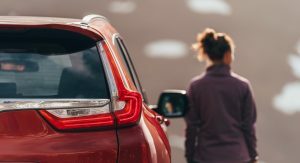 How do we know it’s not selling well? 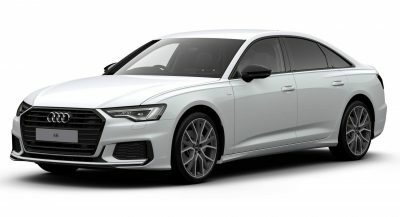 I’ve already started seeing them crop up around the DC area. 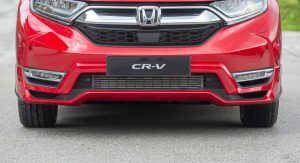 2.0 turbo + lowered CR-V would be something. 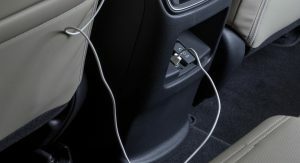 oh how i hate this car… i know i am the only one. 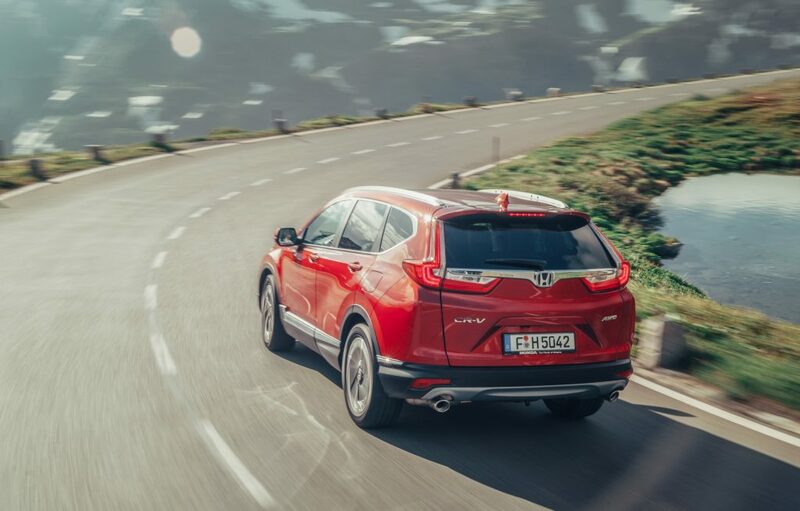 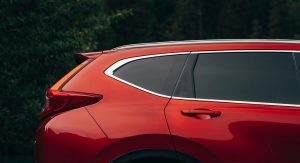 those hideous rear lights flanking way off the side (outwards) of the body just to trick the eye into thinking the suv is wider than it really is, may work on many people, but not me, its a hideous cheap design trick and below Hondas standards. 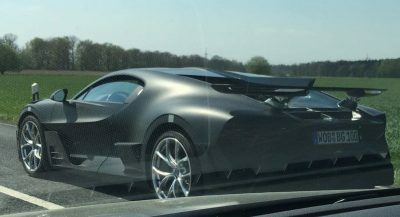 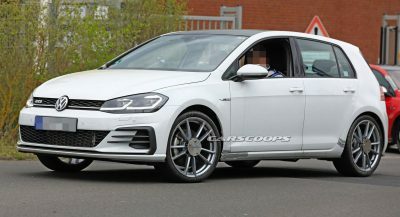 The rest of the car is impressive, those rear lights should not come on the next generation, this current design is terrible. 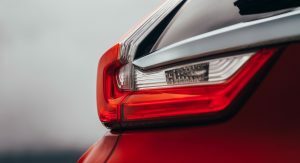 lol the rear taillights are one of my favorite design elements of this car. 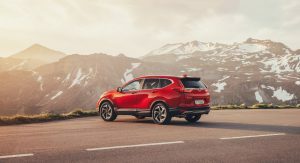 Personally, this is one of Honda’s better designs (this and the new Insight), but I like the look of the Rav4 way more. 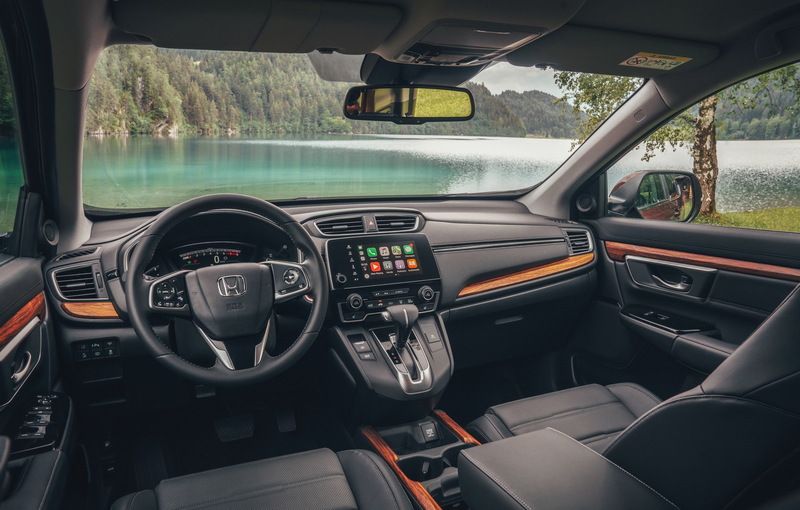 I also actually really dig the interior of this thing.